We love Japan and we love to travel there. But it’s a bit of a challenge to find Japanese food (which we love, too) as a vegan in Japan. Usually Japanese food is very fish based, so there is fish stock in almost every dish. But luckily there is an emerging trend called “macrobiotic food” in Japan. 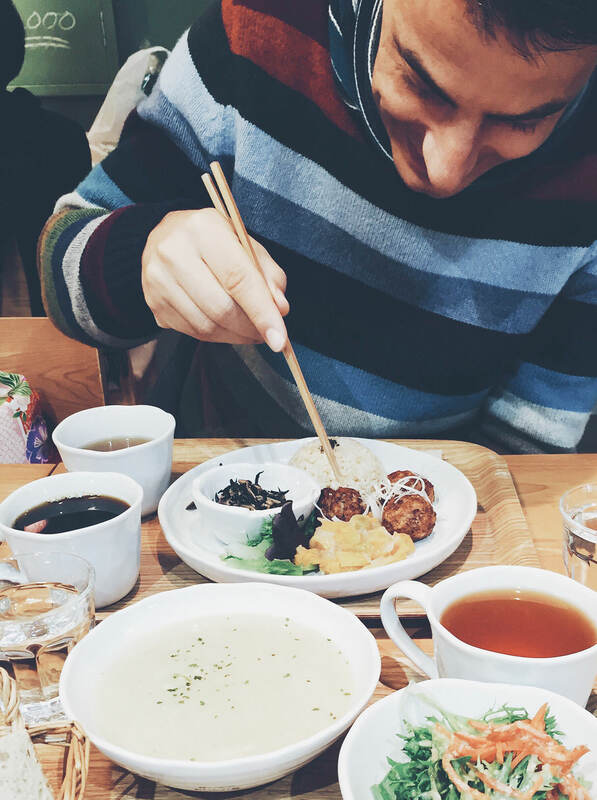 And macrobiotic turns out to be vegan, too :) So you can find more and more cute café style lunch spots offering vegan macrobiotic set lunches or café style food. In Fukuoka in the south there is even a place inside the Hakata train station offering set lunches for traveling passengers. It’s called Evah Dining, if you ever around there :) In Tokyo we often went to the Lima Café, since it was pretty central and the lunch was lovely and the people there were super friendly. It’s also a small food store, so you can get bento sets and even vegan instant ramen noodles to go. They have a range of organic products as well. Vestibulum rhoncus eros at eros tincidunt, pretium auctor diam fermentum. Nam tincidunt quam ac metus eleifend bibendum. Vivamus non erat enim. Pellentesque habitant morbi tristique senectus et netus et malesuada fames ac turpis egestas. Cras imperdiet pulvinar metus at sollicitudin. Aenean vitae arcu quis sem mollis porttitor. Vestibulum pellentesque leo sed ante consequat, sed fermentum augue blandit. Sed scelerisque accumsan neque, ac semper magna feugiat sit amet. Mauris vitae nisl venenatis nibh elementum tincidunt. Proin magna arcu, tempor tristique diam a, porttitor imperdiet libero. Morbi at urna justo. Phasellus congue ullamcorper laoreet. Cras orci orci, condimentum eu quam ut, rhoncus consequat nisi. Phasellus semper ipsum sit amet eros maximus, id euismod ligula elementum. Donec mattis, risus vitae finibus suscipit, ipsum mauris vehicula magna, id rutrum dui est nec purus. Nunc id tempor nisl. Fusce nulla nulla, pharetra in velit at, laoreet sagittis mi. Suspendisse ornare enim et vestibulum viverra. Duis pretium sem at leo feugiat, vitae iaculis turpis placerat. In tellus nisi, posuere a nisi vitae, convallis pharetra sem. Aliquam erat volutpat. Pellentesque ultrices luctus pellentesque. Phasellus fermentum, lectus ac posuere maximus, eros turpis vestibulum enim, sit amet finibus leo purus ac enim. Etiam suscipit eget magna quis blandit. Suspendisse accumsan vestibulum dictum. Nunc scelerisque, lacus non molestie eleifend, turpis mauris auctor risus, at scelerisque ligula leo sed sapien. Vivamus mollis hendrerit leo, non lobortis massa malesuada vitae. Proin eu vehicula risus, sit amet molestie arcu.